On October 16, an American University team of six undergraduate public health students beat out graduate and medical student competitors to win the grand prize at the third annual DC Regional Public Health Case Competition. The event was hosted by the National Academy of Medicine, formerly the Institute of Medicine. The competition promotes interdisciplinary, problem-based learning around a public health issue that faces the DC community. This year, the event focused on mental health and included teams from Georgetown University, George Washington University, Howard University, the University of Maryland, Uniformed Services University of the Health Sciences, and George Mason University. The winning team included Caroline Sell (BS public health and French studies ’16), Alexa Edmier (BS public health ’16), Madison Hayes (BS public health ’16), Shreya Veera (BS public health ‘16), Bailey Cunningham (BA international relations ’17), and Hana Stenson (BS public health ’16). The team received the grand prize of $2,000, and publication of the winning solution in a National Academy of Medicine publication. Each team was composed of three-to-six undergraduate or graduate students representing at least three different disciplines. 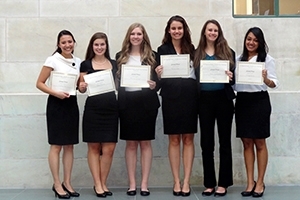 AU’s team was one of only two teams in the competition that was composed entirely of undergraduate students. “Winning this competition is amazing on any level, but the fact that most of the seven other teams were composed of graduate students and medical students makes our grand prize all the more impressive,” said Gardner. The teams were tasked with developing a feasible and creative proposal to support mental health in older veterans, aged 65 and older, living in the DC area. They were given five scenarios, adapted from real-life situations that portray the diverse range of issued faced by older veterans, ranging from undiagnosed Post Traumatic Stress Disorder (PTSD) to substance abuse. They had two weeks to research the issue and develop a comprehensive intervention to address it. The AU team tackled the issue with a proposal titled The Open Door. It included recruiting veteran peer mentors, providing mobility resources, and an interactive resource guide for older veterans facing mental health challenges. On the day of the competition, each team had 15 minutes to present their case solution and they then entertained questions from the judges, who included professionals from the Veterans Administration, the American Psychological Association, the American Association for Retired Persons, and other organizations providing services to veterans. The winning team said that the experience of being on the team—and winning—was one of the highlights of their time at American University.